The 2009-W $10 Margaret Taylor First Spouse Gold Proof Coin marks the thirteenth coin struck by the US Mint to honor the spouses of the former Presidents of the United States. The First Spouse Gold Coin program debuted in 2007 and features a minimum of four coins issued per year on a schedule linked to the release of the circulating Presidential $1 coins. As such, when the coin honoring Margaret Taylor’s husband, President Zachary Taylor, is released, Margaret’s coin will follow shortly. Each Spouse Coin is struck from 1/2 ounce of 24-karat gold. The Mint also produced uncirculated quality versions of these coins as well. Unique for the year 2009, a total of five First Spouse Gold Coins were issued. This is because President John Tyler’s first wife Letitia died while he was in office. He then re-married Julia while still the President linking two spouses to his administration. Both were then honored on separate coins. 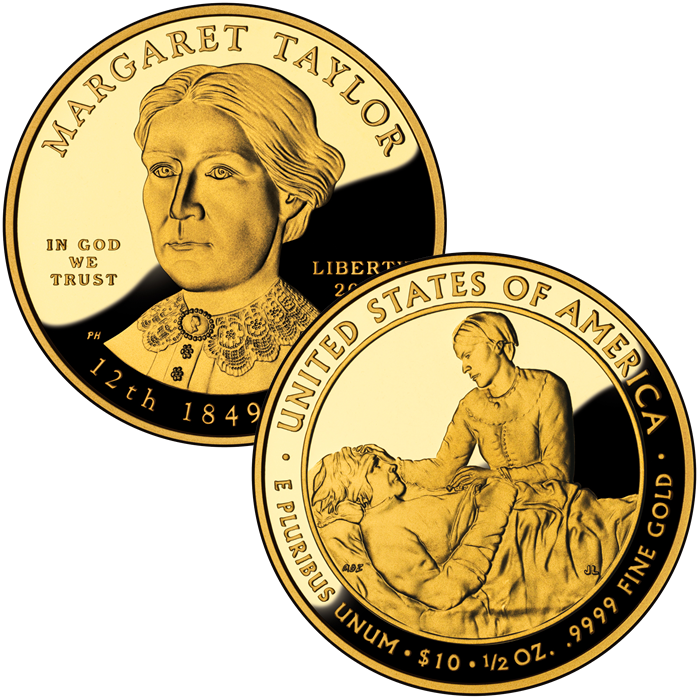 The US Mint released the Margaret Taylor coins on December 3, 2009. 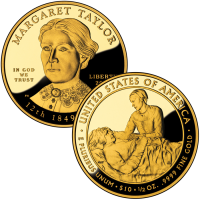 Initial price on the Margaret Taylor Proof Coin was $754. Found on the obverse (heads side) of the Taylor coin is a portrait of the former First Lady. It was designed by United States Mint Sculptor-Engraver Phebe Hemphill and sculpted by Sculptor-Engraver Charles L. Vickers. The reverse (tails side), designed by Artistic Infusion Program Associate Designer Mary Beth Zeitz and sculpted by Sculptor-Engraver Jim Licaretz, shows Margaret giving aid and comfort to a wounded soldier during the Seminole War.